What happen after post youtube video daily for 1 month? This is the result after doing it for 1 month. This result is from 1st January to 28 January comparing to 4th December to 31st December. The result is compared with the previous last 28 days. The watch time went up by 246% . Revenue went up by 88% . From what i had read , i been told that january is actually a low month for advertisement spending as ads company just finish the december campaign . I was hoping for it to hit 25 USD but it miss the target. My sponsor was very satisfied with the result . How it works? How many views = 1usd? it all depend on which country the viewer is from. 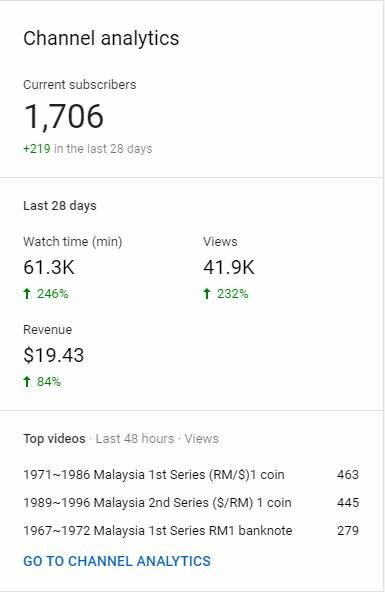 malaysia viewer earn around 1 to 1.5 USD per thousand view . Singapore viewer earn around 1.5 to 2 USD per thousand view . you dont really get all the earning , youtube will take 45% of the revenue. And not all the video get ads serve , cause everyone will leave youtube if too many ads. Mean if i get 4000 view from malaysia and the Cost per mile (CPM) is 2 dollar . let's assume only half of the view got ads serve . The calculation will be like this . i think it is ok considering that youtube need to cover the operation cost . Which mean if you seriously want to make money, you can't do it small . 👍👍 That's another thing to think. How to make it big! So do you have your niche? unlike other media , my type of video as time pass will remain valuable . If you are doing a song , it might become less value as time pass . It is already consider big if you look at what type of collection i cover. I have a dealer support who is borrowing me all his collection to do video. Mine is hard to be viral as it is about history , it is not everyone cup of tea.